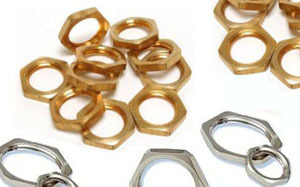 Kingpin – the top name in the nylon locknuts manufacturing sector. We deal direct with the cable gland industry, and have done for many years, so we know the multitude of shapes, sizes and requirements that the locknuts must adhere to. As an important part of the cable gland set up, locknuts are tasked with securing the gland in place and keeping it in one piece when it is strained. A not fit for purpose nylon locknut can be detrimental to both the quality and the safety of the cable gland. So, we aim to deliver the perfect locknut for your needs every single time. Nylon is the best non-metallic material to use in cable gland set-ups. As an alternative to our standard brass locknuts, Kingpin’s nylon locknuts are just as reliable, thanks to a combination of sturdiness and light weight. Our nylon locknuts are of such a high standard that we have supplied industries outside of the cable gland industry. A lot of companies trust Kingpin to make their high quality nylon locknuts, and so should you. We make everything in our own facility, so don’t expect any shoddy, third party work here. Every product that leaves our doors is a reflection of the company, so we ensure that it is of the highest quality. You can rest assured that you’ll be getting the best possible nylon locknut for the job. – Elite standard nylon locknuts – We are a name that businesses trust, because we only produce the absolute best nylon locknuts. – Precision engineering – Our products will be nothing short of perfect, down to the most minute of details. – A very quick turnaround on items – A high standard of tooling and employee knowledge combines to deliver industry leading production and delivery times. 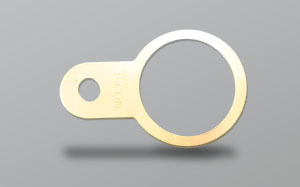 Earth tags are just as vital as locknuts in securing the safety of the cable gland. They provide an earth connection, reducing the chances of electrical shock. For our full range, click above. Nylon locknuts not to your taste? Kingpin have a wide selection of alternatives. Click above to see them. 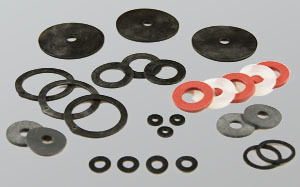 Keeping the outside out, and the inside in, washers provide a great deal of protection. Kingpin’s are available in a wide selection of sizes and materials.